Harley is hitting some bombs out of the park! Harley Quinn is a formidable foe with a baseball bat, but when you swap out balls for live bombs, her game turns lethal. Decked out in athletic gear, Harley is dressed and ready for batting practice and-should he show up-Batman. 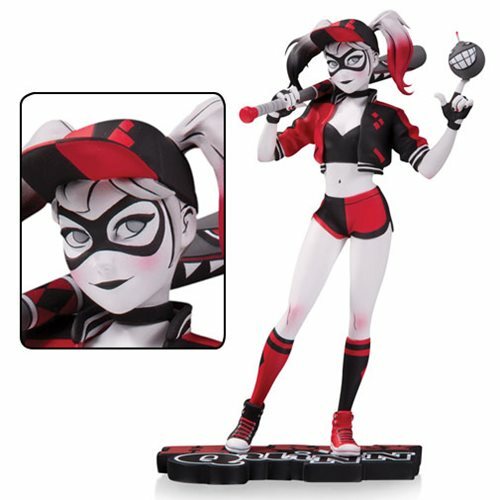 The Harley Quinn Red White and Black by Mingjue Helen Chen Statue stands about 7-inches tall, is a limited edition of 5,000 pieces, and comes individually numbered. Be sure to pick yours up, because it's a guaranteed home run. Ages 14 and up.